In preparation for returning to space, Megatron repaints his armor. He prefers these colors, because they allow him to disappear against the dark background of outer space. There, his actions are made silent by the vacuum, and blackness hides his movements. Hidden in the dark, he seems to attack from nowhere. He is a ghost in the cosmos, striking down his enemies without hesitation, and without mercy. Remarks: Shadow Blade Megatron is, of course, a repaint of the previous Animated Megatron, which I’ve already reviewed. So we’ll just be looking at the differences here. There have been no changes to the actual mold, the electronics and sound effects are the same as well, so it’s purely a repaint. Megatron now appears mostly in black, with a grey cannon on his arm and various purple highlights on his body. A very nice, very dark paintjob overall. I like it a lot. 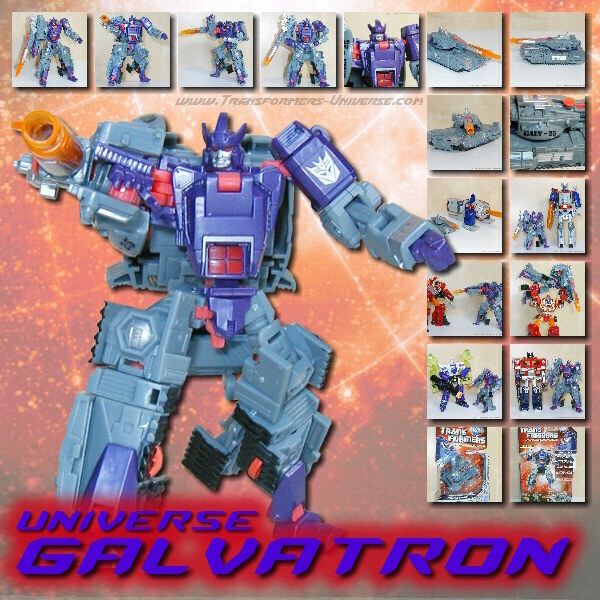 To me, though, the most interesting thing is that this was the first Megatron repaint in a good long while that wasn’t renamed Galvatron. Megatron he was and Megatron he remains, just mostly black. A very nice repaint, but the only reason I got him was because he was on sale at our local Intertoys. He’s very nice, but not so nice that you need to get him when you already got the original Animated Leader Megs. If you don’t, though, and see his guy somewhere, there’s no reason not to get him.